Walk & Wag 2014 - H.A.L.T. 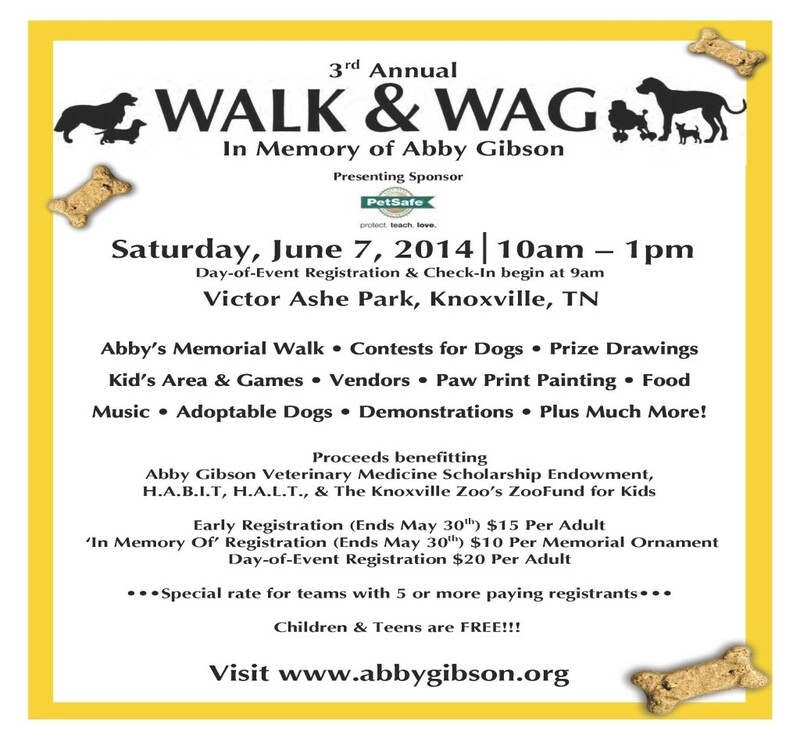 Please join us on Saturday, June 7, 2014 for the 3rd Annual Walk & Wag held in memory of ten-year-old Abby Gibson. This dog friendly, family event will be held at Victor Ashe Park from 10am to 1pm with day-of-event registration and early registration check-in starting at 9am. This event is RAIN OR SHINE. Come and join us for Abby’s one mile memorial walk and a day full of fun for you, your dog, and the whole family! Proceeds of this event will benefit the Abby Gibson Veterinary Medicine Scholarship Endowment at UTCVM, H.A.L.T., H.A.B.I.T., and The Knoxville Zoo’s ZooFund for Kids. To learn more about the beneficiaries of this year’s event, please CLICK HERE. After walking and wagging in memory of Abby, attendees will have the opportunity to: visit with sponsors, vendors, and animal-related non-profits; participate in contests with their dogs; watch animal related demonstrations; play games in the kids area; enjoy some delicious food; enter prize drawings, participate in a scavenger hunt with chances to win prizes; and much more!! !